The computer mouse has been around for nearly as long as the computer has — the first trackball was invented as part of a secret U.S. government military project back in 1952! Since then, there have been many variants of the mouse, with most new iterations better than the last. We’ve written before about the surprisingly well-designed Microsoft Arc Mouse. And we love (and always travel with) an Apple Magic Mouse. But somehow every mouse we’ve used also has something about it that doesn’t feel quite right. 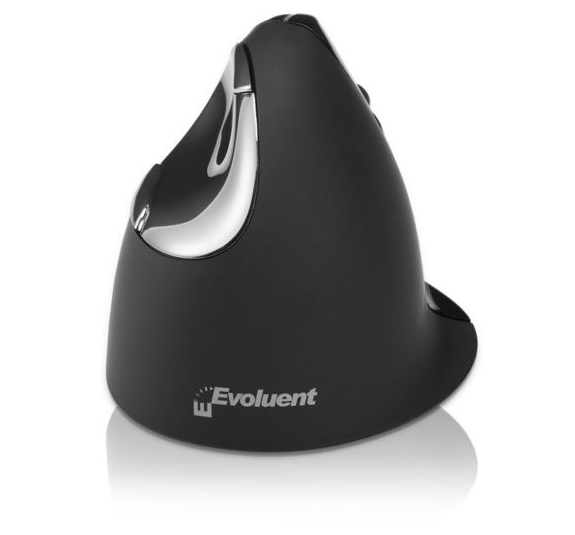 We couldn’t figure out what exactly that something was until we tried the Evoluent VerticalMouse 4. Turns out, the problem with most every computer mouse and trackpad is that it forces your hand into a palm-down position. It is more natural to be palm-sideways. It may seem like an insignificant difference (and it would be if you were only using a computer mouse for a few minutes a day) but that twisting leads to strain and stress in your wrist and forearm. 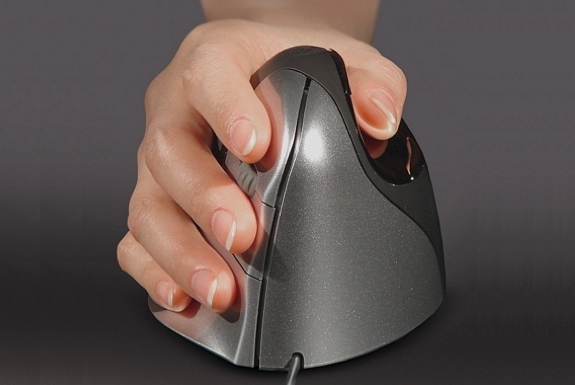 The VerticalMouse solves this problem by working with your hand’s natural posture. Imagine the position your hand and arm is in when you initially grab a glass that’s on on the table in front of you. That’s similar to your positioning when using a VerticalMouse 4. You won’t notice the benefit of it at first. In fact, the VerticalMouse is initially a bit slow and frustrating to use. Give it a few days, though, and you’ll not only be pointing-and-clicking at the same speeds you were with your old mouse, you’ll be noticeably more comfortable while doing so. In addition to the real, and potentially dramatic, ergonomic benefits, we love the programmable buttons† of the VerticalMouse 4. There are six buttons in total: two thumb-operated, three finger-operated and a pushable scroll wheel. Another cool feature is the ability to use one of those buttons to change the pointer’s tracking speed on the fly; small LED lights on the side of the mouse indicate your current speed setting. What’s the downside? The VerticalMouse 4 is a bit bulky for travel. 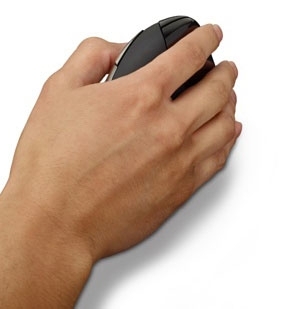 Also the VerticalMouse comes two hand sizes (“small” and “regular”) in both right- and left-handed design — and that could make sharing a single VerticalMouse between two people problematic. At $89 for a USB-wired version — or $110 for Bluetooth wireless — a Evoluent VerticalMouse 4 is also on the expensive side. If you are totally pain-free using your current mouse, that investment isn’t necessary. 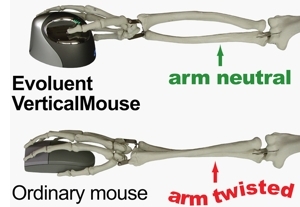 But if your hand, wrist or arm aches (even a little) after prolonged computer use, it is amazing the difference a VerticalMouse can make. † The VerticalMouse is plug and play, but to program the buttons on a PC you’ll have to download some free software. On a Mac, there’s a driver that installs in System Preferences.